Every year, our team gets together just before the holidays to celebrate the year as well as give back to the community. At our luncheon, one of the biggest awards presented was our “2017 Growth Award,” an annual award instituted last year. 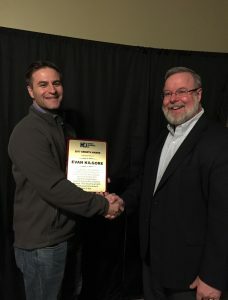 This award is presented to a Huffman Engineering, Inc. team member who displays personal growth with intentional application toward moving the company forward. The resulting growth betters everyone around him or her. [Evan] works in a steady manner with an intensity that is impressive. Through disappointments, he picked himself up over and over, applying what he learned with each disappointment to strengthen his approach for the next time. He sought advice from people across Huffman Engineering, Inc. and applied what he learned. He is thorough, hard-working, and driven. As a result of his continued efforts, he has been able to book a significant amount of sales – enough to sustain the Denver office for the next year- with many of those bookings coming in just the last six months. Growing from a contributing engineer on projects to a design engineer, sales person, project manager, site manager, and visionary, we are pleased to have Evan on our team. Congratulations and thank you to Evan for his exemplary work in getting the Denver office off to a strong start.